20 gram gold bars are an inspired choice for new and established buyers. They represent a substantial increase in terms of portfolio value, yet they’re still easy to store and carry. All our 20g bars come from LBMA approved suppliers and they’re minted from 999.9 (24 carat) gold. They’re also a convenient option for professional travellers who wish to use gold instead of cash and 20g gold investment bars are VAT free to buyers in the EU. 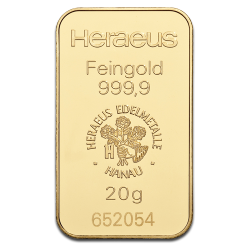 Take advantage of our attractive prices and explore a wide selection of 20g gold bars from acclaimed brands like Heraeus, Valcambi and The Perth Mint.